Regular guest and staff complaints of poor soil removal from shirt collars, with white collars in particular looking unacceptably grubby. 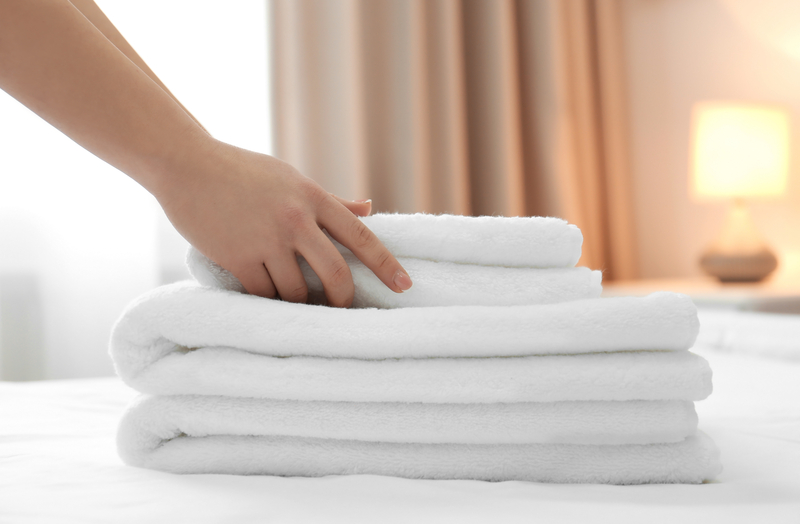 Residual odours on towels from the hotel spa and on cloths from the hotel kitchen. Yellowing of guest towels, sometimes after only a few washes. Premature disintegration of spa towels after only a few weeks in service. Complaints from very grumpy chefs regarding irremovable yellow and brown staining on what should be odour-free pristine white jackets. So, what are the opportunities for the staff member tasked with ordering a new washer? Let’s take them one by one! Requires a process which addresses the skin sebum from the wearer which contaminates the inner surface in contact with the wearer’s neck. This needs a machine with good mechanical action, sensitive chemistry and good temperature control. Mechanical action can be achieved with stout lifters, the ribs which run front to back around the inside of the machine cage. These must be capable of lifting the textiles as the cage rotates to give a ‘lift and drop’ action, which is so effective at breaking down collar grime. Soil removal can be achieved with a good dose of a premium detergent, but automatic addition of a small amount of the correct emulsifier will probably prove more effective and more economic. It is essential to blend the hot and cold water feeds to give an accurate pre-wash temperature in the range 35-40C, to achieve rapid softening of the skin oils on the collar, without exceeding 40C (which would start to set these stains onto the fabric). The Hydrofinity machine is particularly effective at producing high quality results with shirts because it offers mechanical action from ‘lift and drop’ combined with the action of the XOrbsTM. These overcome the resistance of skin oils to coming away from the textile surface and effectively ‘pull’ the problem contamination off the material. These give off very different odours, but the problems they pose are in fact very similar. It is almost impossible to completely remove them using a standard dose, even of a very good detergent. Kitchen oils and fats tend to harden in a hot kitchen and need something stronger than a detergent to break them down. Spa products contain highly refined essential oils which are even more difficult. One technique is to break them down chemically using an emulsifier, but this must be matched to the type of oils and greases on the textiles. The Hydrofinity machine is interesting, because the XOrbs appear to remove both spa oils and kitchen fats and greases, with little or no need for separate emulsification products. This is a quite widespread problem and it is frequently associated with very unattractive dank odours, which become very obvious to the user when drying the skin after a hot shower. At worst these can resemble stale perspiration, which give rise to the question ‘has my towel actually been through the wash?’ The causes of the yellowing and the associated odours is poor removal of the perspiration and other skin contaminants. This is sometimes the result of poor softening in the pre-wash. A temperature just a few degrees above 40C is sufficient to set the proteinic skin sebum, which is rubbed off the skin onto the towel by the user. Once set in this way, it is not all removed in the main wash and in the tumble dryer it is well and truly ‘cooked’ and rendered pretty well irremovable. It does not come off in the re-wash and further ‘baking’ in the tumbler produces the characteristic yellowing. This overall grubby yellowing should not be confused with the patchy yellow staining produced by the effect of chlorine bleaching products on chlorhexidine, the disinfectant used in a great many spa products and retail skin treatments used by guests. If this becomes a problem, the best solution is to cease the use of chlorine bleach and switch to hydrogen peroxide. This is another consequence of poor removal of the highly refined essential oils present in so many spa products. If these become ‘set’ by too high a temperature in the pre-wash, they survive the main wash and then are prone to thermal breakdown in the tumble dryer. The breakdown products tend to be acidic and these rot cotton towels very quickly, so that they tear or go into holes after 20 washes or so. This makes it essential to have a machine which can be precisely controlled to deliver consistently the correct pre-wash temperature for example. This is all it takes to avoid some of the consequences described here. Clean chef clothing is fundamental to a good and caring image for the entire restaurant operation. The days when the chef had to accept, stoically, garments which were smelly, stained and no longer white are long gone. By applying the techniques described here for assured softening and complete removal of protein soiling and staining, it is possible to produce chefswear which they can be proud to wear and which is hygienically clean and fresh. The essential secret of a machine design which can fully meet the demands of a quality hotel is to specify one with a range of programmes which can reliably remove proteins and oily soiling from the wide variety of textiles and contaminants to be expected in modern hospitality. The programmes need to be backed up by a facility which allows up to four chemicals to be dosed accurately into the appropriate stage of each programme. Precise blending of hot and cold feed water streams must give the right pre-wash temperature to avoid setting of soiling and staining and the consequent discoloration, odours and reduced textile life in many cases. Removing moisture can vary significantly with machine design. It is not just the spin speed which determines this. The force of the spin is a complicated combination of cage diameter and rotational speed. The important comparison when rating different machines is the G-factor of the force in the final spin. This varies with the square of the spin speed in rpm multiplied by the cage diameter in cm. Machine B has a spin speed of 900 rpm and a cage diameter of 90cm. Machine A has a spin speed of 1000 rpm and a cage diameter of 60cm. In this example, Machine B delivers a 35% better extraction force than Machine A, even though it has a lower spin speed. In energy terms, spinning out moisture mechanically in the washer uses only one-fifteenth of the energy of drying it in the tumbler! Tumble dryers are conventionally rated on the wet weight of work they can safely accept, which means the better the spinning the more productive the dryer. The length of the drying cycle is determined by the initial moisture content of the textiles, so the better the spin, the shorter the drying cycle, giving a further boost to dryer productivity. The difference in productivity and operating cost (over the life of the new washer) of purchasing a machine which can handle wet towels in the most economical way will usually dwarf any difference in purchase price. Buying the cheapest is rarely the smartest choice! The mix of machine sizes in a modern hotel laundry is determined by the total daily weight of the work mix. However, if guest valet work is to be undertaken profitably, it pays to have a range of small machines to hand to cope with small numbers of high revenue items. There is nothing worse than having to process a single blouse in a 50kg machine because the right size machine is not available!